A fellow writer mentioned that client projects sometimes took longer than they'd hoped, and they wanted to learn to write faster. While there are plenty of ways you can increase your writing speed, one tip I gave them was to try using what I call "skeleton outlines." I worked through the beginning stages of one while they watched just to show how quick the process could be. And today I'd like to share the resulting example I created so you too can give this technique a try. This post kicks off a new series where I'll highlight some of my favorite writing resources and strategies, showing you exactly how I use them, and occasionally sharing my personal tools that I've created to use in the day-to-day running of my business. Let's take a look at what skeleton outlines are and how they can help you get through writing projects big and small. A skeleton outline is a high-level breakdown of your content. It lets you know what's coming -- what you have to write -- without you actually thinking about the meat of that content. A good way to think of it is to picture a nonfiction book's table of contents. The TOC might list the book's sections, chapter titles, and even major sub-sections or topics covered in each chapter. That's similar to a skeleton outline for your writing in that it breaks down the content into its smaller parts. If you were to write a nonfiction book, you might start with an outline of that nature which would look quite similar to the finished TOC. But skeleton outlines can be used for just about any kind of writing. I use them for press releases, white papers, blog posts, case studies, video scripts, podcast episodes, web copy, and more. If I write anything at all, it probably starts out as a skeleton outline of sorts. 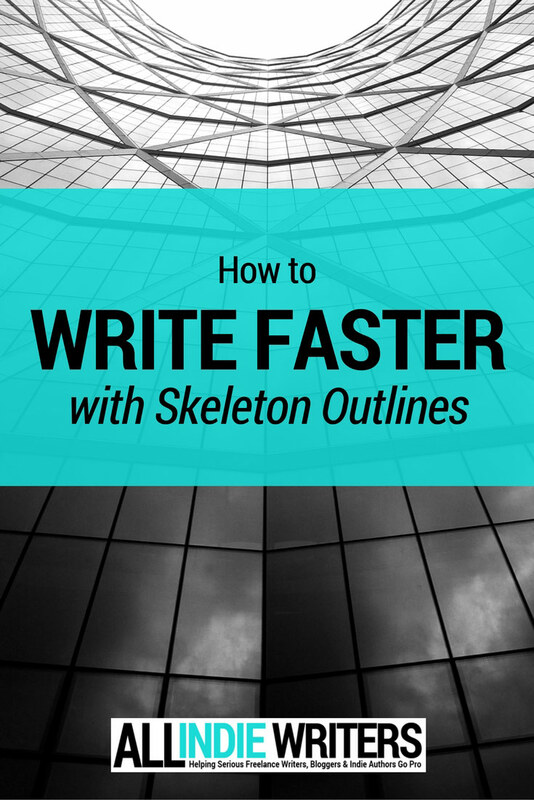 How Can Skeleton Outlines Help You Write Faster? You'll know exactly what research you need to conduct, so you don't waste time gathering unnecessary information. You can shuffle ideas around before you fully commit to them, minimizing rewrites for the sake of maintaining your content's flow. When you have a skeleton outline breaking things down into smaller bits, you don't have to write in a linear fashion. For example, you can hop around between sections or tackle the easiest sections first to give you a motivational boost (my favorite part). Once you have the initial skeleton outline, you can start fleshing out the rest of your content. For me, that involves several passes where I build up each section in layers. (While that sounds slow, those passes are quite quick -- a minute or two for the first, and up to maybe five minutes for the last before I turn that into a full draft.) For you, it might mean going from skeleton outline to full draft in one shot, simply using it as a road map. Let's look at an example of a skeleton outline for a blog post and how I might flesh things out if I were going through multiple passes. In this version you'll see that the only actual content is the post title and sub-headings. In this first pass, you're simply deciding where you want the content to go. I then put in placeholder text for body copy, intros, transitions, and lists to give me that skeletal structure -- a frame I can flesh out. In this next example you'll see a somewhat fleshed out version of the same post's outline. You'll notice some notes, or points I'd want to make in the post, were added in the first sub-section. I also listed the five tips I'd want to cover both as a short-form list for the "scanners" reading the blog, and then transferring those tips to the sub-headings below where each can be covered in more detail. I went a step further here by adding notes under those tip sub-headings (well, I did one of them for the sake of the example, but normally I would do the same for all). You could do that in this step or in another pass-through depending on how quickly you're blitzing each stage. From the example above, you could move into your first full draft. Or you might choose to add another pass-through if it's a research-heavy (or media-heavy) post. In that case, after you've noted the key points you want to make, you dig up supporting data, charts, illustrations, or whatever else you might need before fleshing out the writing itself any further. That's all there is to it. Skeleton outlines are a simple tool. They're quick to work with and easy to use. And they should help you push through writing projects without getting stuck as often. That's especially true when you get into the habit of flying through the first couple of phases. What's great about skeleton outlines is the fact they never leave you staring at a blank page wondering what comes next. You know what topics you're covering. You know what points you want to make, and where. And you know how everything has to tie together. And having that simple organizational structure that adapts as you go along can drastically improve your writing speed. If you haven't tried this kind of outlining before (especially going through multiple rapid passes), I highly recommend it. But now I'd love to hear from you. Do you outline most of your writing projects first? If so, what kind of outlines do you use, and what are the biggest benefits you've seen from them? Tell me in the comments below. Thanks for sharing your story Jay. I’m assuming you’re thinking in terms of fiction. In that case, something like The Snowflake Method might be an easier way to start — one sentence story summary, then expand to a paragraph, then to a page, then to 4 pages, then to a scene list from that. A benefit for pantsers is that you still get the whole story out pretty freely. It’s just in a shorter form. I adapt it a little bit. The one paragraph story summary is often easier for me to start with. Then I do a longer version — anywhere from 1-4 pages. Then comes the scene list, and I try to describe each scene fairly well. You could go through scene-by-scene in pantser mode, simply writing the story in shorter form. Then go back and flesh out each scene with better description, improved dialogue, and the research you’ve done where necessary. Basically it lets you write out the full story in a way without worrying about the research yet. Very cool idea. Outlines have always mystified me somewhat. I’ve never been sure what they should look like or what information I should have in them. This gives me a good idea. I’ll have to try it for my next blog post! Thanks! Good tip, Jenn. Most of my outlines are like that and I’ve always found it very helpful. I use this sort of outline for producing most output – except I learned this as ‘mind-mapping’ and use third-party software to draw idea headings and connection lines. It’s a very similar concept though – write your outline, go through and add details, move elements around into a logical order – and in this case print out the end result as one long document for final polishing of i’s and t’s. Thanks Stuart. 🙂 This is a bit different from mind mapping in that you work in a more linear way, but that’s certainly another good option for people who aren’t fans of outlines! I’m writing a chapter for a book, and was asked for a skeleton by a certain date. I didn’t actually know what was meant by a skeleton in this context, so your article has been very helpful. Thanks.